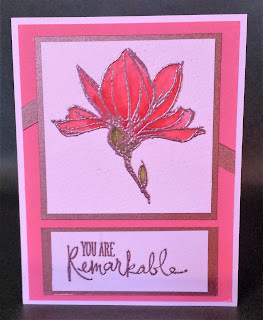 First flower is embossed with the new Stampin' Up copper powder on watercolor paper then watercolored using Sweet Sugarplum and Watermelon Wonder inks. The sentiment is also embossed using the copper powder. 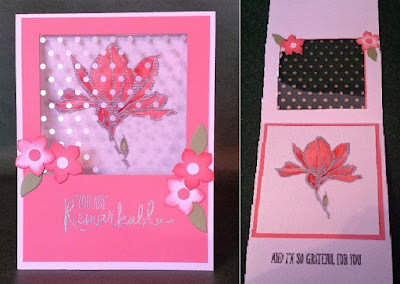 This card has a window cut out and the new Stampin' Up Foil Acetate is used as a window covering. I have the silver side up. The foil acetate is shipped with a film covering the silver side to protect it and needs to be removed when using on a project. The flower inside is embossed with SU silver powder and then watercolored also using Sweet Sugarplum and Watermelon Wonder inks. 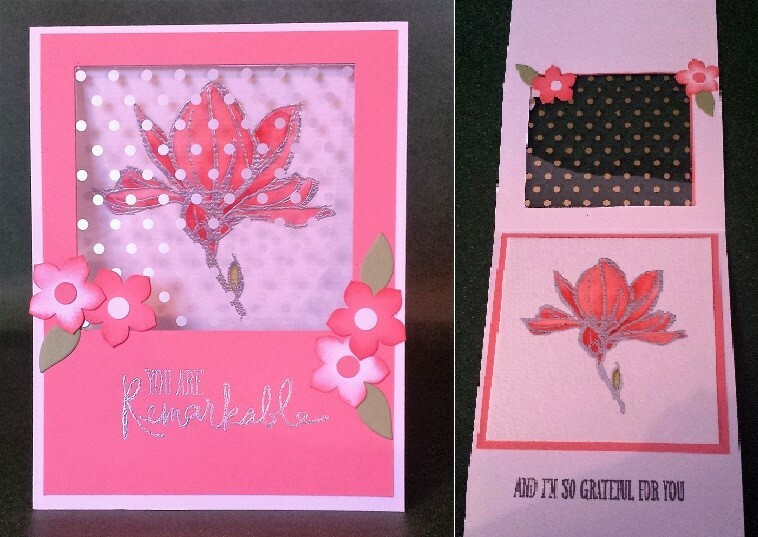 Petite Petal punch was used with a handheld 1/4" circle punch to make the flowers on the inside and out. The outside edges of flowers are edged with Sweet Sugarplum ink. Sentiment on outside is embossed with silver powder. Sentiment on inside on both cards is done in Basic Gray ink.